There are nearly 200 hotels with over 10 000 rooms in Krakow. We verified all of them to offer you only the best ones. Good location in the former Jewish district - Kazimierz, close to the Szeroka St. with many fine restaurants and pubs, within walking distance to the Old Town; clean and cosy rooms; delicious buffet breakfast served in elegant dining room. Located in the heart of Krakow, this unique place was built on the foundation of three paramount values. Tradition. People. History. Opened in June 2016. Nice location in the former Jewish District of Krakow, within less than 15-min walk to the Wawel Castle; tasty breakfast; spacious rooms; homely atmosphere; kind and professional staff. Top 3* standard; rooms at the Pergamin feature a unique design done in brown and beige tones and wooden furnishings; all include an electric kettle, safety deposit box and work desk. Perfectly situated in Jewish Quarter in a restored XV century townhouse; restaurant serving Jewish cuisine; cosy rooms, some with a balcony; unique Salt Grotto, sauna and massage; located on a quiet street; surrounded by excellent cultural spots and restaurants. Varied hot buffet breakfast; nice restaurant that serves freshly grinnded coffee and delicious international cuisine;well adapted for disabled people; huge choice of SPA treatments; swimming-pool; comfortable spacious rooms; friendly & professional staff. Perfectly located, only about 5-8 minutes walk to the Old Town & Railway Station; cosy and clean rooms; facilities for disabled guests; tasteful breakfast; attentive staff always ready to help; restaurant & drink bar; casino; gift & sport shop. Thanks to being located in the heart of Kazimierz District the hotel is close to the Old Town, It is beautifully renovated with great taste. From Szeroka street it is only a short walk to Wawel Royal Castle or Old Town Market Square. Brilliant location just 10 min walk from the Main Market Square; lovely interiors and tastefully arranged rooms; high quality of accommodation that will satisfy even more demanding guests; extremely attentive and courteous staff; sauna available. Winner of Michelin guide and Travelers' choice 2018; within 5 minutes walk to the Old Town, very close to Wawel Castle; nice lobby bar & restaurant at the top floor; fantastic terrace with the view of the Castle and the river; interesting, designer interior. Located halfway between Main Market Square and Wawel Castel, the Michelin Guide 2018 hotel offers a tasty hot buffet breakfast in a very nice restaurant. The rooms are decorated in a classic style with Krakow character. A very welcoming atmosphere with pleasant and helpful staff; awaits all guests. The hotel is well adapted for disabled guests. 2019 Michelin Guide recommended hotel offering a wide variety of spa services and breakfasts fit to kings. Unicus Palace combines modern design and style with an intimate atmosphere of a historical tenement house. Located in the very heart of Main Square; rooms designed in an individual, luxurious way; some rooms overlook St. Mary's Church and Cloths Hall; top quality restaurant decorated with famous Polish artists' paintings; ideal choice for a romantic weekend. Being a part of ECOM Media Group and owing to our experience, innovations, and a cross-selling system, Escape2Poland provides travel services to the world's leading tour operators such as Thomas Cook, TUI, or Neckermann. For over 15 years Escape2Poland has consistently built its business image around exceptional customer service and authentic travelling experience. Personal approach to each and every one of our clients and catering to their most conceivable needs have earned us something we desired from the very beginning – your trust. Having been bestowed with the Certificates of Excellence by TripAdvisor for years, we strive to do everything in our power to learn and progress on our path to the ultimate goal, which is an undisturbed and honest satisfaction of our travellers. With our aid, you will taste a piece of the country where a dazzling and courageous history, well-preserved monuments, as well as undiscovered natural marvels contrast with rapidly-developing modern cities and technological advancements. Hotel Kazimierz provides amazing value for the money. The staff is amiable and welcoming. The rooms are kept clean and tidy and, of course, the location is great! The hotel is situated in the heart of Krakow, really close to the Old Town and the Wawel Castle. Our 5-day stay in Columbus Hotel was truly great! Not only was the price reasonable for this wonderful location, but also we really enjoyed delicious breakfasts served by kind people in love with their city and customs. The real joy of Columbus Hotel is the staff, who, without exception, were kindhearted and courteous. My room was clean, quiet, and cosy with a breathtaking view of the Wawel Castle. In addition, I received welcome chocolates when I arrived! Thanks to Escape2Poland, I saved over 100 euros on my accommodation. Other websites wouldn’t offer such discounts as they did. Next year I’m going to Poland again and I’m sure I will choose this travel service provider without a second thought. Poland has become one of my top destinations and I go back there once a year to visit. Escape2Poland helped me greatly with their wide selection of hotels. What’s more, I really like their website– it’s really well structured and easy to navigate. Millions of visitors each year, thousands of sightseeing spots, and tourist-oriented attractions have generated an extremely high demand for places to stay in Kraków. There are roughly 200 hotels in Krakow and their number is still rising. A large percentage of Krakow hotels accumulates around the Old Town to provide their customers with an optimal experience and a perfect sightseeing location. Nevertheless, you may also find hotels in less hectic areas if you wish to unwind in a quiet atmosphere of suburban Krakow. Think about the hotels in Krakow, that serve traditional Polish food to sample and learn about this delicious cuisine on each day of your stay in Krakow. 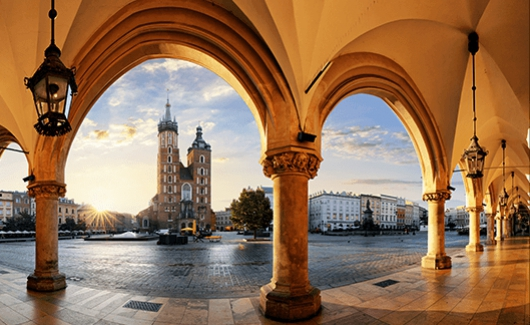 If you are not certain where to stay in Krakow and looking for accommodation that satisfies your needs, check out our website with a wide array of best Krakow hotels at affordable prices. Choose between local and large chained-brand hotels depending on your expectations.